Established in 1988, the Constitution of the Federative Republic of Brazil guarantees the right to health and guarantees that everybody living in Brazil has access to medical care. In practice, access to healthcare is limited, and some people are trying to fight this inequality. 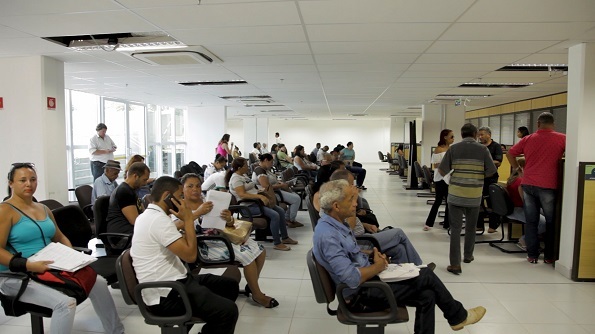 The government budget for public healthcare (Sistema Único de Saúde or SUS) is insufficient, and people have to wait a long time, sometimes too long, for life-saving treatments. People who can afford it purchase health insurance, which gives them access to private clinics and hospitals. But the economic crisis and growing unemployment mean that many have had to cancel their insurance contracts. An increasing number of people can no longer afford the monthly premium, and more and more people are dependent on the limited resources and capacity of public health. An insurance policy generally gives better access to healthcare. But clients sometimes have to wait for the insurance company to authorize the treatment, and in some cases, this authorization is refused. This can result in legal cases over the contractual obligations of the insurance company, consumer law, and constitutional rights. People being attended by the Public Defender (photo by Brechtje Boeke). Together with filmmaker Brechtje Boeke, we show the experience and knowledge of people who take the government and their insurance company to court to force them to pay for medical treatment; the views of a public defender and a lawyer who are professionally involved in legal actions against the state and insurance companies; and the perspective of an activist and an economist on the relationship between inequality and financing health care. This documentary is part of ongoing fieldwork on insurance and health in Brazil by Erik Bähre and Fabíola Gomes. The research is part of the Moralising Misfortune project, principal investigator Erik Bähre, funded by the European Research Council (ERC) under the Horizon 2020 Research and Innovation Programme (Grant Agreement No. 682467).